KITTY HAWK, NC, April 14, 2014 —Eleven teams gathered last weekend at Kitty Hawk, Outer Banks, North Carolina to battle for a trip to the National Championship of the Oakley Surf Shop Challenge at a yet undisclosed location in Central America. Eckner Street greeted competitors with clean and contestable one-to-three-foot surf with nippy water conditions. Picture perfect weather in the 70s were enjoyed by spectators and teams alike, as performances were nothing short of very entertaining for all. The Oakley Surf Shop Challenge’s format is very unique allowing two shop employees and two shop team riders to formulate their “team” working together as they compete against other shop teams in a one-hour heat only allowing three waves per rider. Each team is granted a “double whammy” guy allowing one score to count twice, they each have a tent or “box” they cannot leave in that hour and all must return before the heat horn sounds or a 5 point deduction is taken off of their total heat score. Every rider and score posted is crucial for their overall score, making this format a competitor and crowd favorite alike. After three heats total, four teams battle it out in the Finals hoping to secure their free ride into the national showdown. Heat one showed team Whalebone looking solid until the latter part of the heat where team Duck Village Outfitters’s Juan Carlos dropped a solid 8 on his backhand with a backup score from double whammy surfer Jeffrey Myers celebrating a victory with heat totals as follows: 28.61 to 25.84. Heat two saw a close battle with OBBC taking the win and Surf City securing second place 22.44 to 21.86. In heat three, reigning champs Sweetwater Surf Shop took the nod as competitive elite Ben Bourgeois practically double whammied the team straight into the Finals. “Conditions for the Finals were extremely tough with small and inconsistent surf,” said event standout and Finalist Juan Carlos. 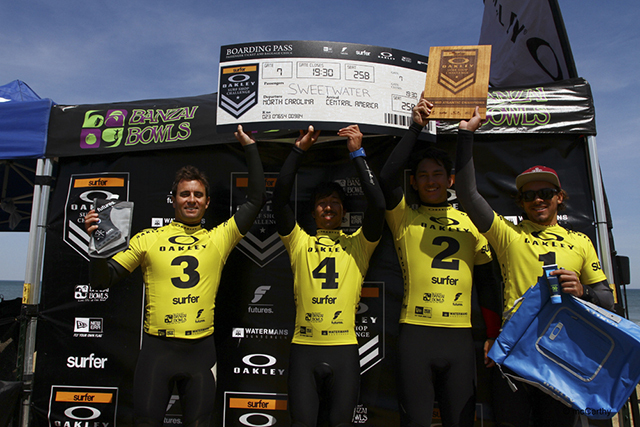 “Everyone had a great vibe in the water and we performed to the best of our abilities”. With Mother Atlantic literally taking a 30-minute siesta in the Final, very few scores were given as the clock ticked away proving this Final would be won on strategy rather than sheer performance. Sweetwater’s Benny B dropped a high 8 to be double whammied, stirring the pot with little to any time left for an honest rebuttal. With under five minutes remaining, DVO’s Jeffrey Myers threw in some tactical defense on both team 17th Street and team Whalebone with only one chance to match Benny B’s 8, a low seven was double whammied falling just short of the score needed to take down the defending champs!